One of the many things that sets Geotab apart from the pack when it comes to GPS Fleet Tracking is its integration with add-ons, accessories and apps. Apps allow you, as the fleet manager, to download a variety of add-ons that use the data your Geotab devices collect, in all sorts of different ways. That’s on the software side of things. On the hardware side, there are some incredible options out there on the market now that integrate with your existing Geotab system to add to its benefits as an all-in-one fleet management solution. 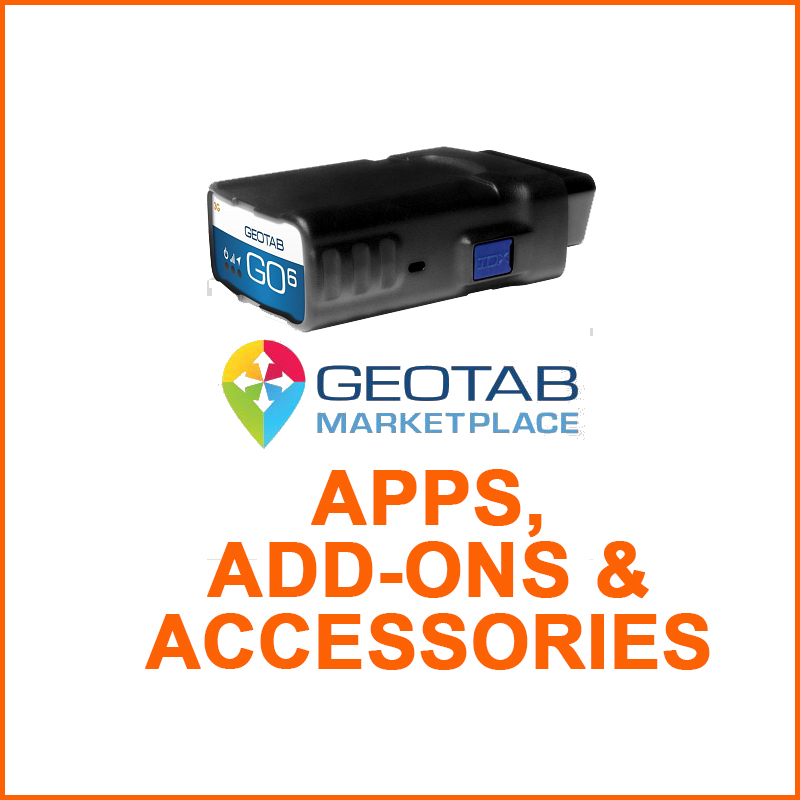 To help you better understand how these all can be used, let’s explore the broad categories of apps, add-ons and solutions available on the Geotab Marketplace – which is, essentially, an app store for your Geotab device. Many of these are free to download and integrate. MyGeotab Add-Ins: These can be integrated with the MyGeotab platform to give you access to more info, or lay out the information in different ways. Hardware Accessories & Add-Ons: For the most part, these are physical add-ons to your Geotab fleet tracking devices, adding features like video monitoring, temperature monitoring, in-vehicle feedback, or a range of other options. Mobile Apps: Seamlessly integrate features from Geotab with you, or your drivers’, existing mobile apps. General Software Solutions: Apps grouped in this section cover a variety of purposes and uses. Now, let’s take a look at a few of these third party options that really illustrate the range of the functionality you can add to your Geotab GPS fleet tracking system and MyGeotab management platform. Keep in mind, there are many, many more apps and options available on the Geotab Marketplace, so definitely be sure to check it out for yourself. This route optimization app/reporting platform allows you to efficiently measure the effectiveness of your routes. It makes use of Geotab’s real-time telematics data, in combination with industry-leading routing software. Geotab Drive. Geotab Drive is the industry-leading solution for electronic onboard Hours of Service Tracking. It integrates seamlessly with your existing Geotab fleet tracking devices, so that it automatically logs when your drivers’ status changes to It’s the truly modern HOS tracking platform, and best of all, it comes in around 70% less of the cost than the competition. Check out more info on our HOS Tracking app page. Driver’s Camera (Zone Defence) A high-resolution camera that installs in minutes. Front facing and in-cab cameras are both options. This provides telematics information, photographic evidence and coaching opportunities. Cameras can be triggered by pre-set events, such as speeding, sudden stops and more. And the Zone Defence system seamlessly links right into your MyGeotab platform, adding another layer to Geotab as an all-in-one fleet management solution. fleetFLIX . Currently in beta testing but coming on the market soon, fleetFLIX offers video and pictures on demand from fleet vehicles at the press of a button in the software or with automated monitoring of exceptions. Video monitoring is a feature that’s gathering increasing interest, so keep an eye out for more apps to come along these lines. Remote Diagnostics (OnCommand Connection by Navistar). Remote Diagnostics makes use of the Geotab SDK, providing managers with a comprehensive update regarding their vehicles maintenance needs. Fleet managers are alerted whenever there’s a fault code fed through the system, allowing you to easier manage your fleet’s maintenance costs, downtime and repair decisions. Advanced Collision Prevention (Mobileye): Mobileye attaches to the inside of the driver’s windshield and links with your Geotab device. It is built to reduce the amount of accidents and severity of accidents in your fleet by providing audible alerts in the event of an imminent collision. These threats can also include other safety hazards, such as improper lane changes, or not leaving enough of a gap between other vehicles. Through its integration with the Geotab platform, the data is transmitted to the fleet manager, who can then take a number of courses with the information and apply corrective action. Maps BI – Interactive Dashboards: Maps BI utilizes your existing Geotab data to provide instant access to highly-visual, beautiful and easy-to-understand dashboards. The pre-loaded dashboards shine a spotlight on important aspects of your fleet management, such as route optimization, safety, customer management and more; all while making use of graphs, charts and other visual elements to make the data easy to understand – and act upon. Reefer Temperature Monitoring (Valor TempTrac): Companies who deliver frozen goods, or high-value assets such as pharmaceuticals via refrigerated transport need to make sure that their refrigeration is operating correctly, or risk taking a massive hit. Valor TempTrac is an add-in to your Geotab unit that allows you to do exactly that. It monitors up to four temperature zones simultaneously and transmits temperature readings through your device to MyGeotab in real time. It’s just one more way that Geotab can function as an all-in-one fleet tracking and management solution for your fleet. Take your fleet tracking to the next level. It’s easy to get started with Geotab GPS. Take advantage of our famous $50 GPS trial offer. Here’s how it works: We send you the devices to try on your fleet; you try them out. They are plug-and-play and install in literally seconds. When you’re ready to buy, we we credit your account for $50 per trial device. There’s no contract, no hassle, and no obligation. Once you’re set up, you can test and experiment with all the apps, add-ins and accessories that help make Geotab a perfect fleet management tool for your business. What are you waiting for? Get rolling today!